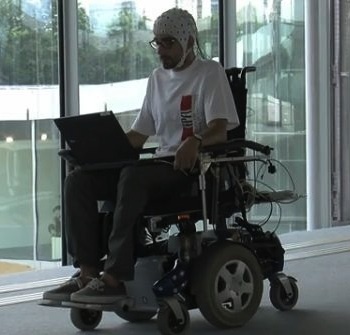 This thought-controlled wheelchair uses EEG readings of the brain patterns to control and operate a wheelchair. The prototype was developed by researchers at the École polytechnique fédérale de Lausanne (EPFL) in Switzerland. The brain-computer interface allows for easy steering, but is still rudimentary. That's why researchers are also working on the development of assistive technology, involving the use of small cameras positioned on the sides of the chair. A software analyzes the image, recognizes the obstacles and refine the trajectories accordingly. Tom Carlson has joined the Center team neuroprostheses few weeks ago in order to perfect the technology assistance. "It will improve the steering, either in terms of security or accuracy," says the young doctor from the Imperial College. The system requires a high level of artificial intelligence. For example, it must learn to differentiate types of objects on the path of the wheelchair - furniture, people, door frames. I don't know about you, but the first time I encountered the idea of a thought-controlled wheelchair was in The Menagerie, an episode of Star Trek first broadcast in November of 1966. 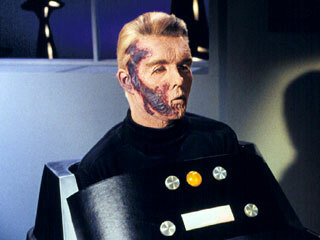 In the show, Captain Christopher Pike is confined to a wheelchair that can be moved forward, backward and turned by his thoughts alone.